Easy to prepare dish makes a great appetizer. Prep time does not include soaking chickpeas overnight. 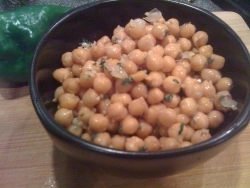 Use canned chickpeas instead of soaking your own. Total Time: 3 hour(s) 10 min. Soak the chickpeas in water overnight. Drain and add to saucepan and cover with fresh water. Heat, covered, over medium-low for 3 hours. Drain and place in a serving bowl. Add the remaining ingredients and toss gently. Very tasty! I didn't have caraway seeds so I skipped them and it still came out well. We served it warm, though I had it cold as well later - tastes good both ways. Next time I make it I will add a touch more cayenne pepper - I just used a light sprinkling this time.